Communication Studies alumni who have recently studied advanced writing and editing (academic, business, or technical) may be interested in a December 2013 blog by Alex Peters, "Death of the Desktop" (DesignNews). The ancient cry of The King is Dead! Long Live the King! comes to mind when one ponders the communication art of writing. Our long-ago ancestors created chiseled-in-stone lists of merchandise carried by desert-crossing-camel-convoys, and rulers commissioned stone records of their histories (such as seen in Figure 1, The Chronicle of Nebuchanezzar) to commemorate their great deeds. Humans beat wood into paper and invented ink for writing upon scrolls, from which we obtain much of our early recorded history and religious thought. Thanks to Johan Gutenberg, a German goldsmith, the Gutenberg press in 1439 supplanted rooms of scribes copying books and eventually broke the glass ceiling on knowledge-owning. Knowledge came out of its intellectual closet and made itself available to many as the ability to read was spread around the world by teachers writing on dusty chalkboards. 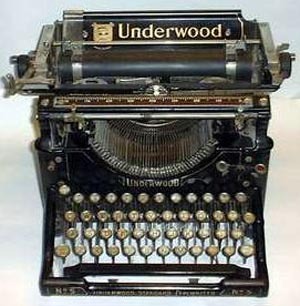 In the mid-1800's, the typewriter was invented, soon followed by the QWERTY keyboard and typewriter ribbons. In 1961 I learned to type in a high school class, and twenty years later worked with an electrical typewriter. The fashion soon changed to dedicated work processors. I tried to teach my mother to use one for her genealogy reports, but she could not remember the command-key combinations and thus depended on a small, portable non-electric typewriter like the one I used in high school and college and on which I first encountered page-layout challenges for the church youth group's newsletter that had to be created on a stencil for the church secretary to use to "run off" copies on the church's mimeograph machine. The green mimeograph stencils tore easily, and typos could not be easily corrected once cut through the waxy stencil. Page layout, then, was a matter of typing on paper, cutting out the passages I wanted, and pasting them to a sheet of paper that functioned as my guide when I re-typed the passages onto the stencil. Visuals were few and difficult to render on stencils, so when copy machines replaced mimeograph machines, I felt that I was in page-layout heaven. Churches and schools subscribed to appropriate clip art, which we literally cut out and pasted onto our master. I discovered something about myself: I have a wicked sense of humor. I use the word, wicked, in a literal sense. I had to avoid allowing myself to position certain visuals with certain texts lest I offend readers and those who depended on me to produce whatever the publication was: church newsletters, school newsletters, Boy Scout publications, teaching materials, and so on. When personal computers arrived, I was not immediately freed from subscription clip art. At the time (pre-Web), I could only afford a dot-matrix printer, so I was pretty much still tied to typewriters and office copy machines. However, I located a word processing program that I really liked and that expanded my page design options: Word Perfect. By the time the Web and Netscape Navigator killed typewriters for good, I had mastered WordPerfect 4.2 to 5 and could make text sing if I wanted. Then Microsoft released Windows, and WP could not adapt quickly enough. Microsoft took over the office-program-battlefield. Those old battles (Apple vs IBM vs CP/M, DOS vs Windows, Netscape vs Explorer, and more) are ancient history now, and the victors claim to have the superior product. That is not necessarily true, but I leave to others the joy of trying to make that case. I know what happened to me, and that is that I learned HTML and could design Web pages. That was all I needed, and I went to it with a vengeance. About that time I learned the term, technical writer, and realized that was what I am. I write, design pages, and produce communications to make something about life better for others. That I can do that **and** teach are my sustaining purposes in life. I have a sneaky suspicion that my grandchildren will take on more and more importance in the coming years. In the meantime, I am still that crazy lady at the computer of this ancient animated gif, Figure 3. Now, as we approach 2014, we are seeing that Smart Phones taking over the niche desktop computers had come to occupy over the last 25 years. Just as once we were thrilled to own a dot-matrix printer attached by cables to our desktop computer with its monstrous monitor, we now use thinner-than-a-book laptops with wireless connection to a three-in-one machine that will photo copy, print, or fax for us. However, even laptops do not have the advantages of smart phones in terms of fitting into our pant's pockets and helping us to go anywhere, take our picture, record our thoughts, and instantly share it all with whoever we want or the entire world. Now page design must be mobile (like this site) to fit smart phone screens and FlipIt style reading. Pages must allow for responsive interaction (expanding or contracting on command and the selection of actions or views, and must now feature commonly understood of icons (Figure 4). These icons are free for both personal and business use according to the Web site, iphone monsta. Those who would serve the new king must be ready to jump again and again as "look ma! no hands!" smart glasses and other new technologies change our world in the coming years. Think about the personal resume, Electronic job boards have nearly made the paper resume obsolete. For instance, how would you design your resume for someone wearing Google glasses?